Many people are looking for the best classical guitar, the best flamenco guitar or the best acoustic guitar. Sometimes that search takes long time and lead people into frustration. They are so many guitar brands and so many guitar models out there that I understand how confusing that may be for the potential buyer. If we concentrate in the middle to upper range of classical guitars and flamenco guitars the choices still very wide but assuming that guitarists are looking for a quality guitar, preferably hand made and with a good reputation, our main recommendation is to look for a guitar made in Spain. The reason in simple, these guys have been making guitars for centuries and they also have managed to combine traditional methods with the innovation of modern manufacturing. Brands like Alhambra guitars, Raimundo Guitars, Admira guitars, Camps guitars or Ramirez guitars just to name a few can actually make your dream guitar without breaking an arm and a leg. If we move up to the 500€ range the quality that we can get may surprise more than one. Solid top guitars with solid top back and sides in some cases made with quality woods dried naturally not in ovens. The sound and action in those guitars correspond to much more expensive guitars. 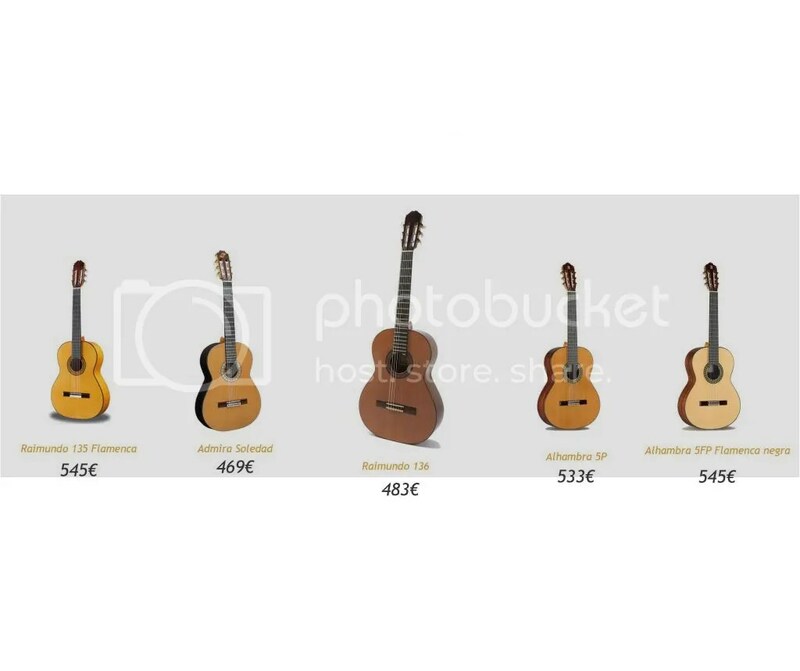 From 1.000€ and up you will find professional classical guitars and professional flamenco guitars, totally hand made and with a quality that can rival those from reputed Luthiers with small production. Those guitars are great for professional guitarists and advanced students that don’t want or can’t afford to spend a fortune in a guitar. The quality of details along with superb sound and selected woods makes those guitars a great investment for the future because they age incredibly well and the sound of the sound board improves with age. These days the demand of amplification systems for classical and flamenco guitars is increasing and spanish guitar manufacturers incorporate in their catalogues a big range of them. those guitars are available with or without cutaway and are also available in full body or narrow body versions. You can get the same quality woods and craftsmanship of the equivalent standard model and they are equipped with the best amplification systems from renowned brands like Fishman, Shadow or Roland. The sophistication of the spanish guitar have made them to incorporate MIDI systems in some of their models. Guitar makers like Raimundo, Ramirez or Camps have dedicated MIDI guitars with the best performing MIDI converters and pick-ups in the market like RMC or Roland. Just to make it clear, the guitar of your dreams exist and it’s here. You don’t have to expend a fortune to get it and is easy to find thru our web site. Wether you are a looking for guitar for beginner, advanced student or professional guitar player, your guitar is here. Please contact us if you need any advise or you are not sure about the guitar you need. Posted in Acoustic Guitars, classical guitar music, Classical guitars, electro classical guitars, electroacoustic guitars, flamenco electric guitars, Flamenco guitar music, Flamenco guitars, flamenco instruments, flamenco music, flamenco players, guitar, guitar music, Guitar players, MIDI guitars, musical instruments and tagged alhambra, alhambra guitar prices, alhambra guitars france, alhambra guitars germa, alhambra guitars uk, alhambra guitars usa, best classical guitar, best flamenco guitar, buy a guitar from spain, classical guitar, classical guitar prices, electroacoustic guitars, flamenco electric guitar, flamenco guitar, flamenco guitar midi, flamenco guitar prices, Guitar, Luthier, midi classical guitar, Ramirez, ramirez 2ncwe, ramirez 4ncwe, ramirez guitars, Spain, spanish guitar brands, Spanish guitar making, tips to buy a guitar. Bookmark the permalink. The only Jose Torres guitars that are being sold at this moment are very cheap guitars manufactured in China with an spanish name like Jose Torres for marketing purposes. That doesn’t mean that your guitar from 1968 is one of these necessarily. In fact, at that moment chinese factories did not made copies of spanish guitars. There probably was an spanish guitar maker called Jose Torres and he gave his name afterwards to the manufacturer that makes the current line of chinese guitars. I’m afraid I can’t tell you any more about your guitar. I now have a few photographs of the guitar that I could send if that might help in identifying it. Fairly clear shot of the label. If you want to send them to me, I will try to find out some more information of your guitar. thanks, I’ll send them out this evening after I get home from work. Appreciate your assistance. Thanks for your response. I suppose the guitar I’ve got will have to remain a mystery. Just an FYI, the label gives the street address as 24 Plaza De La Conception but no city name. I would guess that almost every city in Spain has as street by that name.